I Can Mu metals redirect a magnetic field? I am trying to find a way to decrease the force between two magnets by putting a physical barrier in the middle of them. I’ve reasearched and found that Mu metals redirect the flux of the magnetic fields so those two magnets shouldn’t have any noticeable attraction between them. Of course, before buying Mu metal, I would like to ask if will it work and is there another material that can do such a thing? They are neodynium magnets. I don’t know if a keeper could also do the job. What shape? Can you post a picture? You can use the UPLOAD button to add a PDF or JPEG file, or you can click the little painting icon to paste in a URL to a picture, like I did for the red magnet above. Also, can you show how the 2 magnets are arranged? I have one magnet laid down like the two magnets at the right, and a group of magnets ( like the one of the left of the image )on top of the singular magnet. Both interact with repelling forces and I need to put something in between so that those forces barely act on each other. Any ideas ? So it looks like those magnets are magnetized axially (one flat face is N and the other flat face is S). To contain that B-field, you need a u-shaped piece of ferrous metal that you can slip over the top and bottom faces that fits fairly close to both, and has the two outer pieces connected along one or 3 of the sides. I couldn't find a picture of one, so hopefully that makes sense. If you only do that "keeper" for the bottom magnet and not the top stack, the top stack will be attracted to the ferrous keeper below it. What spacing are you wanting between the bottom magnet and the top stack? Are you wanting to go from repelling to no force (other than the force of gravity on the top stack of magnets)? Are you wanting to basically turn "on and off" the repulsion? Would going from repulsion to attraction also work? BTW, having the keeper that close to such a strong magnet will likely require a fairly thick keeper wall, to avoid saturation. Once the keeper material saturates, any B-field above the saturation level leaks past the keeper and will still interact with the other magnets. I’m hoping to turn on and off the repulsion. 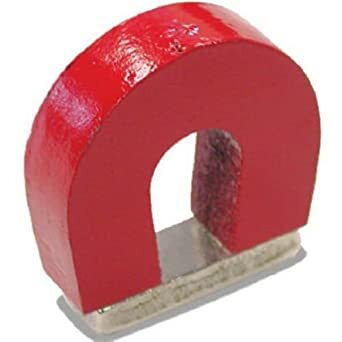 Basically put both magnets at a small distance ( 5-7 cm ) and from time to time, be able to put any material between and observe how there is no repulsion when the material is in between. My following question is does that ferrous metal which forms part of the keeper attract or repel the magnets? , because I’m trying to avoid it. Also, were could I get such a keeper? Thank beforehand for the help. You may need to know that whatever solution you use (keeper or mumetal) it will take energy to put it between the magnets to "turn off the repulsion" as you put it. This energy might be similar to that required to simply turn one of the magnets around. Aside: Many people try to make so called free energy or perpetual motion machines using magnets and shields in their design. They don't and can't work because magnetic force is a conservative force. Look it up on Wikipedia. In short it means that any system that returns to its starting condition (typically once per revolution) can't do any work. This is regardless of the path taken in the meantime. Its a bit like gravity. The potential energy between two points on a mountain depend only on the height difference not the path taken between them. Magnetic shields effectively only changes the path taken in the magnetic field so no shield design no matter how complicated can help make energy. That’s a good reply. Thank you. I’m hoping to turn on and off the repulsion. "Can Mu metals redirect a magnetic field?" You must log in or register to reply here. Related Threads for: Can Mu metals redirect a magnetic field? Mu-Metal + N52 grade magnet. B Can magnets be used to send a metal ball through a pipe?